O'Donnellan & Joyce is offering for sale a stunning four/five bed detached property located in the heart of Clarinbridge village. This is an opportunity to acquire an awarding winning home within a development of 26 individually designed detached houses. The award-winning The Parklands also offers four acres of communal green areas consisting of two tennis courts and a playing field to the rear of the estate which is for use by the residents of the development. The homes offer excellent accommodation and space throughout. No 14 The Parklands is a beautiful, bright, spacious detached residence with a site area of just under a third of an acre and accommodation spread over 3,000sq ft. The property has an entrance hall, family room, an open plan kitchen/dining room with conservatory, a separate utility room, office/optional fifth bedroom, a bathroom, and a larger main living room on the ground floor. Upstairs the accommodation comprises a family bathroom and four double bedrooms, with two bedrooms en suite. There is an additional room with its own entrance on the ground floor which is currently used as the home gym area and has carpeted/wooden flooring, and there is access to the attic via a Stira stairs. Solid wooden floors, space and light, private walled patio area off the utility room, balcony off master bedroom, fully alarmed, and quality decor, fixtures, and fittings are among the extras on offer throughout this wonderful home. The Parklands is without doubt unrivalled and provides not only family homes but a way of life. Viewing is a must and highly recommended. The BER is C2. 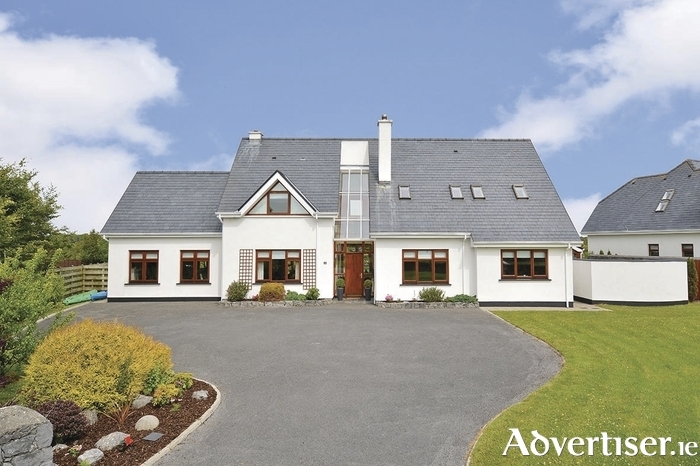 Asking price is €575,000. Contact Colm O'Donnellan or Kyle O'Brien at O'Donnellan & Joyce auctioneers Ltd on 091 564212.